The one important insight that i want to share is that all this is about mathematical infinity and is very much a rigorous thought experiment. The problem though is that it has become somewhat embedded in our mathematics and in the calculus in particular and this then blindly travels over into empirical applications. For example, mathematical continuity as a rigorous concept depends on mathematical infinity. All this leads to rigorous mathematics that has a real potential to fail in the empirical world and does. As it turns out the idea of empirical infinity is extremely important in understanding particle physics although the theorists have never really appreciated this at all. They should have clued in from Dyson's work although he also failed to understand the import. All this is foundational to my Cloud Cosmology which has produced shocking insights while conforming wonderfully to the observed universe as disclosed over the past century. A good read here on Cantor. The idea of class sorted out the differences rather well and allowed order to be created out of potential chaos..
A W Moore is professor of philosophy at the University of Oxford and Tutorial Fellow of St Hugh’s College, Oxford. His latest book is The Evolution of Modern Metaphysics: Making Sense of Things (2012). 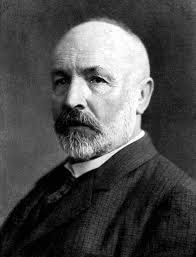 In 1883, the brilliant German mathematician Georg Cantor produced the first rigorous, systematic, mathematical theory of the infinite. It was a work of genius, quite unlike anything that had gone before. And it had some remarkable consequences. Cantor showed that some infinities are bigger than others; that we can devise precise mathematical tools for measuring these different infinite sizes; and that we can perform calculations with them. This was seen an assault not only on intuition, but also on received mathematical wisdom. In due course, I shall sketch some of the main features of Cantor’s work, including his most important result, commonly known as ‘Cantor’s theorem’. But first I want to give a brief historical glimpse of why this work was perceived as being so iconoclastic. Ultimately, my aim is to show that this perception was in fact wrong. My contention will be that Cantor’s work, far from being an assault on received mathematical wisdom, actually served to corroborate it. The standard conception of the infinite is that which is endless, unlimited, unsurveyable, immeasurable. Ever since people have been able to reflect, they have treated the infinite with a curious combination of perplexity, suspicion, fascination and respect. On the one hand, they have wondered whether we can even make sense of the infinite: mustn’t it, by its very nature, elude our finite grasp? On the other hand, they have been reluctant, indeed unable, to ignore it altogether. In the fourth century BCE, Aristotle responded to this dilemma by drawing a distinction. He believed that there is one kind of infinity that really can’t be made sense of, and another that is a familiar and fundamental feature of reality. To the former he gave the label ‘actual’. To the latter he gave the label ‘potential’. An ‘actual’ infinity is one that is located at some point in time. A ‘potential’ infinity is one that is spread over time. Thus an infinitely big physical object, if there were such a thing, would be an example of an actual infinity. Its infinite bulk would be there all at once. An endlessly ticking clock, on the other hand, would be an example of a potential infinity. Its infinite ticking would be forever incomplete: however long the clock had been ticking, there would always be more ticks to come. Aristotle thought that there was something deeply problematic, if not incoherent, about an actual infinity. But he thought that potential infinities were there to be acknowledged in any process that will never end, such as the process of counting, or the process of dividing an object into smaller and smaller parts, or the passage of time itself. Aristotle’s distinction proved to be enormously influential. Its importance to subsequent discussion of the infinite is hard to exaggerate. For more than 2,000 years, it more or less had the status of orthodoxy. But later thinkers, unlike Aristotle himself, construed the references to time in the actual/potential distinction as a metaphor for something more abstract. Having a location ‘in time’, or being there ‘all at once’, came to assume broader meanings than they had done in Aristotle. Eventually, exception to an actual infinity became exception to the very idea that the infinite could be a legitimate object of mathematical study in its own right. Cue Cantor. Precisely what Cantor did was to demonstrate, with unimpeachable rigour, that the infinite can be a legitimate object of mathematical study in its own right. In particular, Cantor showed that we can acknowledge infinitely big sets – such as the set of numbers 1, 2, 3, 4, 5, 6, etc – and investigate the mathematical properties of these sets. To the extent that this involves considering the members of such sets all together, their infinity can be thought of as being there ‘all at once’. At the core of Cantor’s work is the very idea of comparing sets in size with one another. Now, you can often tell that two sets are the same size just by counting their members. For example, suppose you’re at a meeting, and suppose you count first the number of men in the room, and then the number of women in the room, and it turns out that there are 12 of each. Then you know that the set of men in the room is the same size as the set of women there. But you can also sometimes tell that two sets are the same size without counting. Thus, suppose you’re at a meeting where you don’t know how many people are present, but you notice that people are sitting around the table in such a way that men and women alternate. Then you can tell that the set of men in the room is the same size as the set of women there, even though you don’t know how many there are of either. There are even cases where you can tell that two sets are the same size without being in a position to count. Thus you know that the set of older twins that have ever been born is the same size as the set of younger twins that have ever been born. The basic principle here is that, whenever it’s possible to pair off all the members of one set with all the members of another, as it is in the case of the alternating men and women and as it is in the case of the twins, then the two sets are the same size. Does this principle extend to infinite sets? Cantor didn’t see why not. But here things start to get a little weird. Reconsider the set of numbers 1, 2, 3, 4, 5, 6, etc. The members of this set can clearly be paired off with the members of the set of even numbers 2, 4, 6, 8, 10, 12, etc. For 1 can be paired with 2; 2 can be paired with 4; 3 can be paired with 6; and so on. So if we extend the principle touted above to infinite sets, then we’re forced to conclude that the set of all the numbers is the same size as the set of those that are even, even though the first of these sets includes everything in the second set plus all the odd numbers as well. Some people react by saying that it just doesn’t make sense to invoke comparisons of size where infinite sets are concerned. But that wasn’t Cantor’s reaction. He took such anomalies in his stride. He accepted that the sets in question – the set of all the numbers and the set of even numbers – are indeed the same size. And, although that’s curious enough, it’s not ultra­-curious. After all, perhaps we can show that all infinite sets are the same size. If so, that wouldn’t be especially counterintuitive: sets would be either finite, in which case there would be a further question as to exactly how big they are, or infinite, in which case there wouldn’t be. But no! Cantor’s remarkable discovery – and this is where it really does get ultra­-curious – is that there are distinctions of size to be drawn even in the infinite case. Some infinite sets are bigger than others. A pairing of the sort that we’ve been considering isn’t always available, even when the two sets concerned are infinite. Then a contradiction arises concerning whether 821 is itself excluded or not. If it is, then it belongs to the set with which it is paired (the set of excluded numbers), so it is included. If it is included, on the other hand, then it doesn’t belong to the set with which it is paired (the set of excluded numbers), so it is excluded. There is no satisfactory answer to the question of whether 821 is excluded or included. We must therefore accept that there are more sets of numbers than there are individual numbers. And in fact, with one crucial qualification that we shall come back to, this argument can be applied to anything whatsoever: there are more sets of bananas than there are bananas, more sets of stars than there are stars, more sets of points in space than there are points in space, more sets of sets of bananas than there are sets of bananas, and so on. In general – subject to the crucial qualification that I’ve said we’ll come back to – there are always more sets of things of any given kind than there are individual things of that kind. This is Cantor’s theorem. But what about sets of sets? Are there more of those than there are sets? Surely that’s impossible. How can there be more sets of anything than there are sets altogether? This is a paradox. It is closely related to Russell’s paradox, named after the British philosopher and mathematician Bertrand Russell who discovered it at the beginning of the 20th century. Russell’s paradox turns on the fact that, although a set doesn’t typically belong to itself, some sets, it would appear, do. The set of bananas, for example, doesn’t: it’s a set, not a banana. But the set of things mentioned in this article, it would appear, does: I’ve just mentioned it. Russell’s paradox concerns the set of sets of the former kind: the set of sets that don’t belong to themselves. Does that set belong to itself? As with the question whether 821 is excluded or included, there is no satisfactory answer. Cantor was aware of such paradoxes. But again he was unfazed. He developed a robust and relatively intuitive conception of sets whereby the paradoxes simply don’t arise. On this conception, the members of a set must exist ‘before’ the set itself: the set’s existence is parasitic on theirs. So first there are bananas, then there is the set of bananas. First there are sets of bananas, then there is the set of sets of bananas. More generally, first there are things that are not sets (bananas, stars, etc); then there are sets of these things; then there are sets of these things; and so on, without end. On this conception, then, no set belongs to itself. For a set can’t exist ‘before’ itself. (If we want to talk about the set of things mentioned in this article, we first need to be more precise both about what ‘things’ we have in mind and about what counts as ‘mentioning’ one of them. Once we’ve done this, we’ll be able to acknowledge such a set, but it won’t belong to itself.) Every set, moreover, is succeeded by further new sets to which it itself belongs, sets that didn’t already exist when it itself came into being. So there is no set of all sets. This circumvents Russell’s paradox, because the set of sets that don’t belong to themselves, if there were such a thing, would be the set of all sets (because no set belongs to itself). However, there is no such thing on this conception. So the question whether that set belongs to itself or not never gets a chance to arise. The paradox that there are more sets of sets than there are individual sets is likewise circumvented. Cantor’s theorem applies only where sets are being compared in size: this is the crucial qualification to which I referred earlier. Thus, although we can say that there are more sets of bananas than there are bananas, this is because the set of sets of bananas is bigger than the set of bananas. By contrast, we can’t say that there are more sets of sets than there are sets. That would mean that the set of sets of sets is bigger than the set of sets. But this makes no sense on Cantor’s conception. Neither the set of sets of sets nor the set of sets exist. So the question of whether one of these sets is bigger than the other, likewise, never gets a chance to arise. The conception of sets involved here is, as I’ve already said, relatively intuitive. But isn’t it also strikingly Aristotelian? There is a temporal metaphor sustaining it. Sets are depicted as coming into existence ‘after’ their members, in such a way that there are ‘always’ more to come. Their collective infinity, as opposed to the infinity of any one of them, is potential, not actual: its existence is spread ‘over time’ rather than being located at any one point ‘in time’. Moreover, it is this collective infinity that arguably has the best claim to the title. For recall the concepts that I listed earlier as characterising the standard conception of the infinite: endlessness, unlimitedness, unsurveyability, immeasurability. These concepts more properly apply to the full range of sets than to any one of them. This in turn is because of the very success that Cantor enjoyed in subjecting individual sets to rigorous mathematical scrutiny. He showed, for example, that the set of numbers is limited in size. It is limited in size because it doesn’t have as many members as the set of sets of numbers. He also showed (although I didn’t go into the details of this) that its size can be given a precise mathematical measure. Isn’t there a sense, therefore, in which he established that the set of numbers is ‘really’ finite and that what is ‘really’ infinite is something of an altogether different kind? Didn’t his work serve, in the end, to corroborate the Aristotelian orthodoxy that ‘real’ infinity can never be actual, but must always be potential? You might object on the following grounds: to call the set of numbers ‘really’ finite would not only be at variance with standard mathematical terminology, it would also be at variance, contrary to what I seem to be suggesting, with what most people would say. And I agree. Most people, if they’re happy to talk in these terms at all, would say that the set of numbers is infinite. But then again, most people are unaware of Cantor’s work. They would also no doubt say that it’s impossible for one infinite set to be bigger than another. My point isn’t a point about what most people would say. It’s a point about how they understand what they would say, and about how that understanding is best able, for any given purpose, to absorb the shock of Cantor’s results. Nothing here is forced on us. Certainly we can say that some infinite sets are bigger than others, as mathematics nowadays routinely does. But we can also say that the set of numbers is only finite, as (I have suggested) there would be some rationale for doing. For that matter, we could go right back to the drawing board and say that there’s no such thing as the set of numbers in the first place, perhaps on the grounds that the very idea of gathering infinitely many things into a single set is already too great a concession to an ‘actual-infinity-friendly’ conception of the infinite. Sooner or later, on Cantor’s conception, we’re going to have to say something along those lines: at the very least, we’re going to have to say that there’s no such thing as the set of sets. Why not be pre-emptive? None of these remarks are intended as an attack on anything that mathematicians either say or do. I am simply urging greater caution when it comes to interpreting what they say and do, and in particular when it comes to saying how this bears on traditional conceptions of the infinite. Aristotle, on Cantor’s showing, was not so wrong after all.